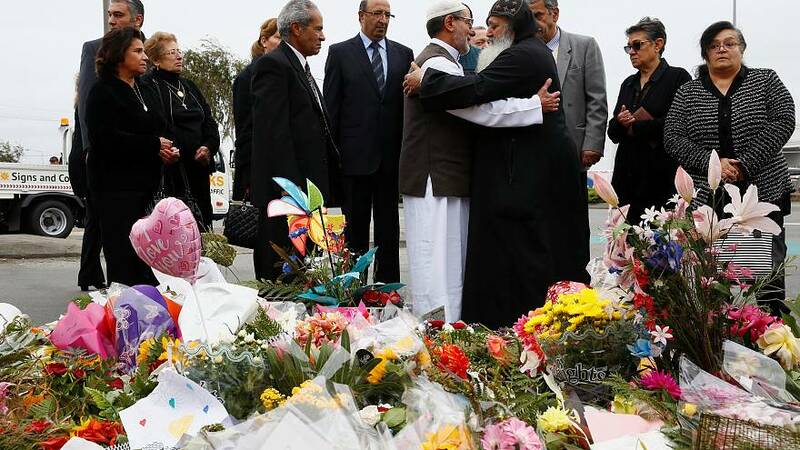 CHRISTCHURCH, New Zealand — Thousands of people paid tribute Sunday at makeshift memorials to the 50 people slain by a gunman at two mosques in Christchurch, while dozens of Muslims stood by to bury the dead when authorities finally release the victims' bodies.Hundreds of flowers were piled up amid candles, balloons and notes of grief and love outside the Al Noor mosque and the city's botanic gardens. As a light rain fell, people clutched each other and wept quietly. "We wish we knew your name to write upon your heart. We wish we knew your favorite song, what makes you smile, what makes you cry," read one of the tributes, which contained cut-out paper hearts under a nearby tree. "We made a heart for you. 50 hearts for 50 lives." Two days after Friday's attack, New Zealand's deadliest shooting in modern history, relatives were still waiting for authorities to release the bodies. Islamic law calls for bodies to be cleansed and buried as soon as possible after death, usually within 24 hours.Supporters arrived from across the country to help with the burials in Christchurch and authorities sent in backhoes to dig graves at a site that was newly fenced off and blocked from view with white netting.Prime Minister Jacinda Ardern said authorities hoped to release all the bodies by Wednesday, and Police Commissioner Mike Bush said authorities were working with pathologists and coroners to complete the task as soon as they could. "We have to be absolutely clear on the cause of death and confirm their identity before that can happen," Bush added. "But we are so aware of the cultural and religious needs. So we are doing that as quickly and as sensitively as possible. "Police said they had released a preliminary list of the victims to families, which has helped give closure to some who were waiting for any news.The suspect in the shootings, 28-year-old Brenton Harrison Tarrant, appeared in court Saturday amid strict security, shackled and wearing all-white prison garb, and showed no emotion when the judge read one murder charge and said more would likely follow.Tarrant had posted a jumbled 74-page anti-immigrant manifesto online before the attacks and apparently used a helmet-mounted camera to broadcast live video of the slaughter.Facebook said it removed 1.5 million videos of the shootings during the first 24 hours after the massacre.The revelation in a late Saturday tweet provided a chilling snapshot of how quickly provocative — and often disturbing — images circulate on the internet.Ardern said the gunman had sent the manifesto to her office email about nine minutes before the attacks, although she hadn't gotten the email directly herself. She said her office was one of about 30 recipients and had forwarded the email to parliamentary security within a couple of minutes of receiving it.Bush said at a news conference that another body had been found at Al Noor mosque as they finished removing the victims, bringing the number of people killed there to 42. Another seven people were killed at Linwood mosque and one more person died later at Christchurch Hospital.Thirty-four wounded remained at the hospital, where officials said 12 were in critical condition. A 4-year-old girl at a children's hospital in Auckland was also listed as critical.Stunned Christchurch residents trying to make sense of the tragedy tied large messages of support to the fence of the botanical gardens where flowers were piling up. "We are a nation who will never accept acts like this!! !," said a poster-sized message decorated with hearts. "We stand with the Muslim community. We will always fight for the safety of our community. We will always stand as one. "Some people sang tributes and others prayed as camera crews from around the world filmed the moving scenes. "We are supposed to be a safe place to go about your business and regardless of what your faith is no one should've had to go through what we went through on Friday," city resident Russell Falcome-Price said.Dozens of Muslim supporters gathered at a center set up for victims, families and friends across the road from the hospital, where many had flown in from around New Zealand to offer support. 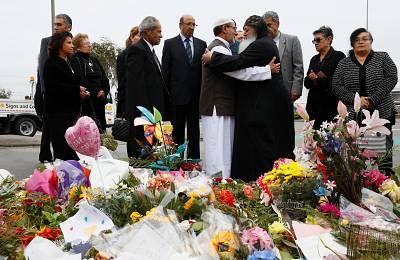 About two dozen men received instructions on their duties Sunday, which included Muslim burial customs.Abdul Hakim, 56, of Auckland, was among many who had flown in to help. "As soon as people die, we must bury them as soon as possible," Hakim said. "We are all here to help them in washing the body, putting them in the grave. "People across the country were still trying to come to terms with the massacre that Ardern described as "one of New Zealand's darkest days. "At the Vatican, Pope Francis offered prayers for "our Muslim brothers" killed in the attack. At his traditional Sunday prayer, Francis renewed "an invitation to unite in prayer and gestures of peace to oppose hatred and violence. "The gunman livestreamed 17 minutes of the rampage at the Al Noor mosque, where he sprayed worshippers with bullets. Facebook, Twitter and Google scrambled to take down the video, which was widely available on social media for hours after the bloodbath.The second attack took place at the Linwood mosque about 3 miles away.Ardern has said Tarrant was a licensed gun owner who legally bought the five guns he used.At a news conference, the prime minister reiterated her promise that there will be changes to the country's gun laws. She said her Cabinet will discuss the policy details Monday.Arden used some of her strongest language yet about gun control, saying that laws need to change and "they will change. "Neighboring Australia has virtually banned semi-automatic rifles from private ownership since a lone gunman killed 35 people with assault rifles in 1996.Before Friday's attack, New Zealand's deadliest shooting in modern history took place in 1990 in the small town of Aramoana, where a gunman killed 13 people following a dispute with a neighbor.